Plitvice Lakes is a unique landmark in the territory of Croatia. This beauty is a huge water body within the Plitvice Lakes National Park, which is included in the UNESCO list of World Heritage Sites in 1979. Within the park's biggest attractions are 16 lakes, each of which is located at a different level. Between these levels an incredible natural system is formed by beautiful cascading waterfalls, The highest of which is 76 meters. Around the park grows thicket and scenic woodland, which gives the protected area closure. Plitvice Lakes National Park with its crystal clear lakes is located in eastern Lika, between the mountains Pleshivitsa and Mala Kapela, near the road that links Zagreb to Dalmatia. The highest point of the Plitvice Lakes is the peak of Mala Kapela, which reaches 1280 m altitude. According to Croatian measurements the area of the park Plitvice Lakes is about 29, 482 ha, of which 22, 000 are allocated to forest areas. The total area of lakes is 217 hectares. Three quarters accounted for the two largest lakes - Lake Kozyak and Proshchansko. Plitvice Lakes National Park with a pure heart can be called a natural phenomenon. The area in which Plitvice Lakes are located was declared a national park on April 8, 1949. Name Plitvice given back in 1777 by the priest Dominic Vukasovich, a man of God from Otochats. Until 1958 the area of lakes Plitvice was inaccessible, and the beautiful waters could be reached only by small forest paths. The then manager of the park - Josip Movchan, began to realize the idea of implementing a system of wooden bridges to be at the convenience of visitors. So the park curator lay the foundation for tourism development of the park Plitvice. Lakes Plitvice is divided into Upper and Lower. The highest of these is the Proshchansko lake, which is located 639 meters above sea level. The most low-lying lake is Novakovic Brod, which is located 503 meters above sea level. The upper lakes are situated on dolomitic basis, which creates an indented relief through strong surface erosion, and forms a normal river valley. The lower lakes are characterized by being smaller and shallower. They are situated on limestone in a canyon of steep cliffs carved by the river over time, even when the lakes Plitvice were not yet formed. All the lakes Plitvice are surrounded by thick forests. The area of the waterfalls is also no exception to this rule. 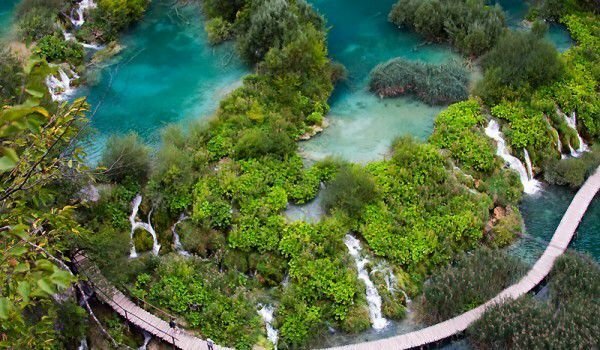 In essence, lakes Plitvice are karst springs, which are fed by groundwater from karst background. It is located only partially within the park. The main reservoir of the water content of the lakes Plitvice comes from streams Crna and Bijela rijeka and Plitvica with Sartuka. They flow into lakes of karst springs and Riječica - in Kozyak and hence, into the lakes from percolating dolomite springs. The tourist base near lakes Plitvice is quite well-organized. There were many tourist routes built. Visitors to Plitvice are even able to sail a boat with electric motor on the Great Lakes. Nearby, conditions are created for campers, and in parallel, there are hotels which are convenient for tourists.